Luxor Furniture is committed to providing high-quality, cost-effective furniture for the classroom, studio, workshop, and home. All Luxor products include a lifetime warranty. Compact Adjustable-Height Utility Cart — This compact, adjustable utility cart is constructed of blow-molded< plastic with a metal frame. 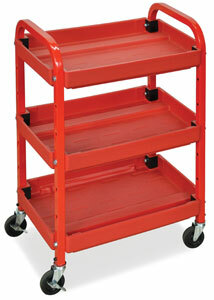 Featuring three tub shelves, the cart measures 32"H × 22"W × 15½"D and has four 3" diameter heavy-duty casters, two locking. The adjustable shelves measure 15½" × 22". Assembly is required. Weighs 23 lb.